Living in Vicksburg, Mississippi for three years, I was not particularly welcomed by all in town. I drove up with New York plates on my car, and even though I baked all my neighbors cookies, only one very sweet woman across the street stopped by to thank me. The rest seemed to sneer about me half behind my back but with enough scorn for me to catch their disdain for me. Sometimes, historic doesn’t involve so much reenactment as simple enactment. I thought that if they were going to treat me like an occupying invader, why not act like one? After all, what had I ever done to them? It’s true that Vicksburg is filled with the evidence of a siege to this day. My wedding was celebrated in the antebellum mansion occupied as Yankee headquarters during the War Between the States. There are still holes in the floor from Confederate cannon ball fire. We consummated that marriage in a bed where General Grant slept, though they had changed the mattress since his departure. Annual reenactments take place on the battlegrounds of the Battle of Vicksburg, and there is a huge Civil War cemetery and park in town. While many tourists come to Vicksburg for the casinos, some come to remember that battle and to pretend to be in it. I never thought that the battle had a thing to do with me personally, until my cousin Marcia did a little research on one of our great-great grandfathers, Andrew Gast. 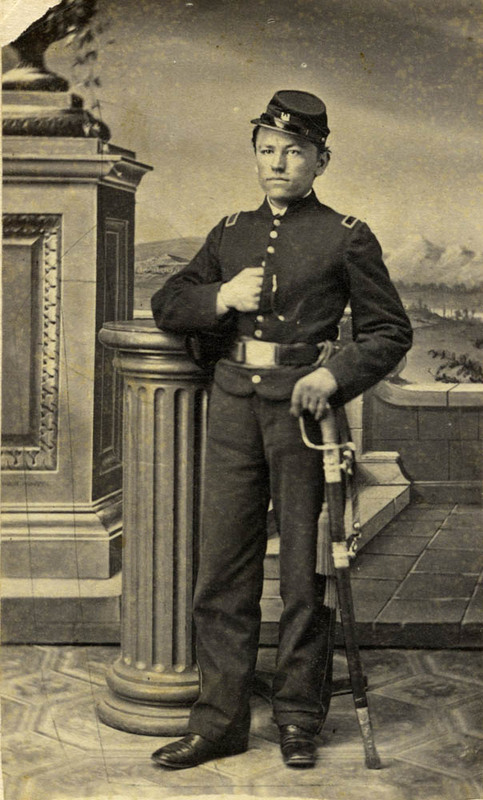 Apparently, as an eighteen year-old farmer in Indiana, he decided to join the Grand Army of the Republic. He marched through Tennessee, Alabama, and he eventually ended up in Vicksburg. He was honorably discharged in Vicksburg, possibly by Grant, possibly as he signed papers in the room where I consummated my marriage. He lived to be old. His corpse was not left on a Civil War battlefield. Our family, like so many Yankee families, has never had much reason to reflect on the Civil War, unlike so many Southern families, who either gained their freedom or lost their primacy over others, maybe lost limbs or lives, maybe lost pride, during the conflict. For my great-great grandfather, it seems to have been a momentary adventure, neither tragedy nor trauma. The fact that he walked away in one piece from the siege of Vicksburg implies he probably took down a Confederate or two, that he at least fired a few volleys in their direction. I suddenly imagine my great-great grandfather, then a teenager, striding vigilantly through the marshy reeds near our house, stepping carefully around the places where he might make noise. I imagine him waiting for orders, getting bored between commands the way my college freshmen students do in my class. I wonder if he slept a night in the big house where my wedding was — Yankee soldiers slept there if they were sick or wounded, and he took sick while he was there, a severe fever, one which he survived. I see my Vicksburg neighbors’ dislike of me in a slightly different light. I was an invader after all. My arrival in Vicksburg was a reenactment of my great-great grandfather’s invasion, only without uniforms and guns. I was once there, or my blood was, to kill them. It wasn’t history. It was me. I was the enemy. I remain the enemy of the Confederacy, though not of the South or contemporary Southerners, which I still love. I cannot know my great-great grandfather Gast’s motives for joining the army, but given the subsequent politics of my family, I can imagine easily that he was against slavery. I, too, would wade through a marsh vigilantly to help end it, were that necessary. Where Vicksburg remains any kind of bastion of bigotry, I remain an enemy invader. Where it is a free city, one where there are many highly educated people, a thriving black middle class, and a place of new ideas, I am a friend, not marching but frolicking. My marriage South, it respects the traditions that do not oppress. After all, I may have sojourned in the very house my ancestor sojourned in Vicksburg. I certainly came there with peaceful intentions, but I occupied just like he did.